The country's beauty pageant is on, and on this coming July 26, Friday, you'll witness the grand awards ceremony at NBC Tent, Taguig City. On that night, Camille Guevarra (Mutya ng Pilipinas Asia Pacific-Intercontinental 2012) and Rizinni Alexis Gomez (Mutya ng Pilipinas Tourism 2012) will crown their successors. 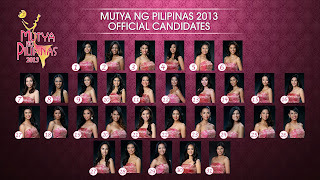 Here are the 31 beautiful Filipinas for the Mutya ng Pilipinas (Pearl of the Philippines) 2013. The 45th edition of the Mutya ng Pilipinas beauty pageant is organized by Jacqueline Tan, the pageant president and franchise holder. You may view here the set of 2013 Mutya ng Pilipinas 2013 Winners. Comments or suggestions about "Mutya ng Pilipinas 2013 Finalist | 31 Beautiful Filipinas" is important to us, you may share it by using the comment box below.